Poor Kien - he has crusty stuff in his ear from an infection, and he has a hole in his eardrum for the gunk to come out. On top of this he is sprouting 2 more teeth on the bottom row. No wonder he has been out of sorts for 3 nights in a row. He has been so uncomfortable and has been waking quite a bit. He wouldn't settle with milk, so he ended up on the floor sleeping with me on Thursday and Friday night, and with Jef last night. I was getting a bit worried it was turning into a habit but tonight he is sleeping like a baby :-P. So hopefully we are over the worst of it. He sings too - the first few bars of "Baa baa black sheep". Now I have to go and get him out of bed. He has been awake for 15 minutes babbling to himself. I love this age! Aww...it was so sweet of Kien to pick a flower for his mama. Here is the real ending to the movie "Playing at Western Park". We have been making the most of summer. 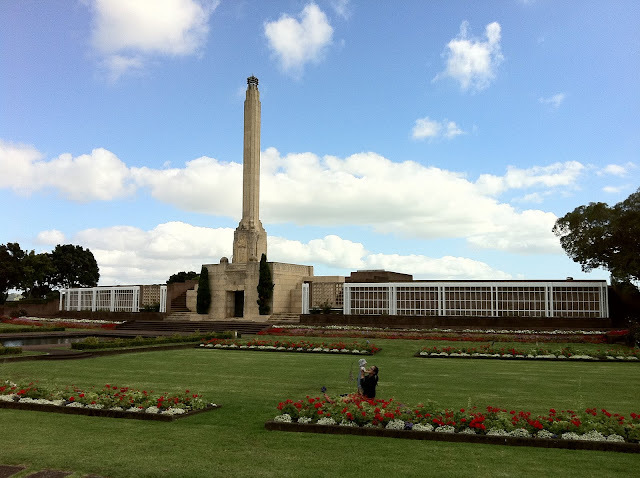 We've been going to the park practically every day, sometimes 2 or 3 times even. 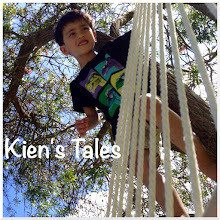 Kien loves playing there, and is growing his confidence and "no fear" attitude! This was on Tuesday evening in between dinner and bedtime. We've been busy busy busy every single weekend. Our weekends are divided into quarters; Saturday morning before Kien's nap, Saturday afternoon after Kien's nap, Sunday morning before Kien's nap, and Sunday afternoon after Kien's nap. Don't get me wrong...our world really doesn't revolve around the child, really! 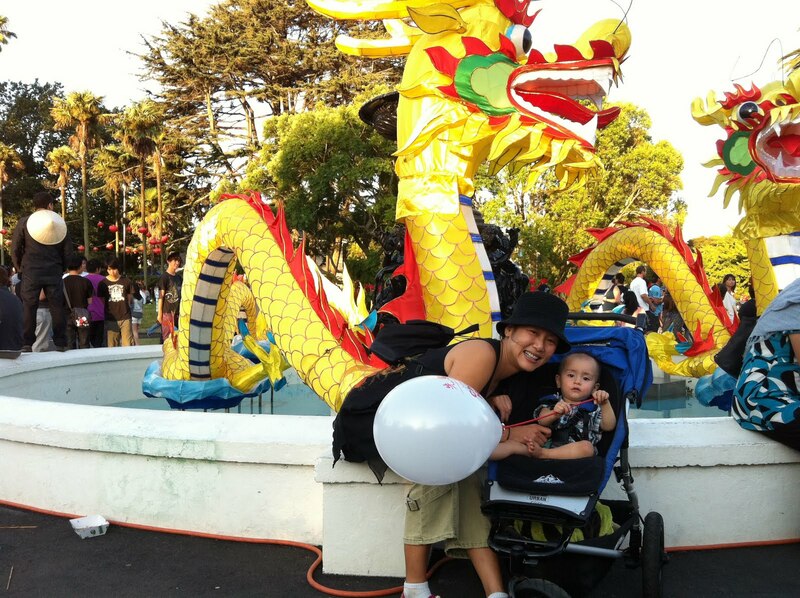 A few weekends ago we took Kien to the lantern festival at Albert Park on a Sunday afternoon. We didn't stay for long, but I did buy a bunch of different types of food and gave Kien a bit of everything for dinner. He was more interested in being friendly with other children. A couple of weeks ago we went kite flying at Bastion Point in the first quarter of the weekend :-) It was a fabulously summery morning. Jef had loads of fun with Kien and the kite he bought for $10 - those Chinese people can sure make them cheap! 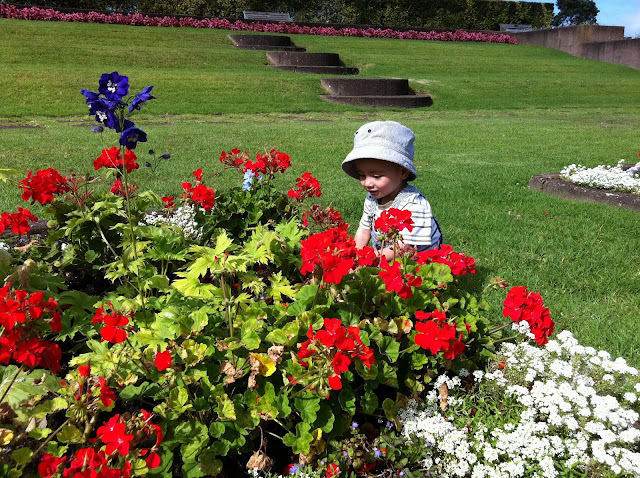 We enjoyed the sunshine and the beautiful manicured gardens, and Kien tasted some of the flowers. Kien is now 14 months old, wow! Even though it has been a rough ride I can't believe he is now officially a toddler. He now walks all the time...only when he wants to, that is. Look what he did the other day. He just looks so cheeky.